Last month, I turned the big twenty-five. Its definitely an age you thought was an "adult" age (or even old!) when you were a child, but as I turned it I definitely didn't feel totally grown up and was not ready to be considered old, so I threw a party to celebrate turning 25 but not being old with a "Childhood" themed party, since I grew up in the 90s it also doubled as a 90s party. Guests were told to dress in costumes reminiscent of their childhood. Sailor Moon was a big part of my childhood, and I remember fondly watching it every morning before school on Cheez TV. 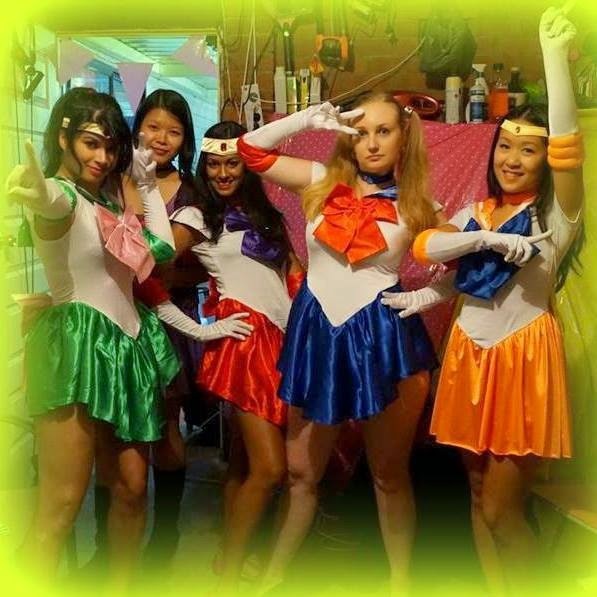 And I wasn't the only girl who was a fan of Sailor Moon, so the uni girls and I were quick to pick the Sailor Scouts as our costume. I chose to go as Sailor Mars as she was my favorite growing up (I always thought Sailor Moon was a bit of a cry baby). With my costume sorted, my next focus was making sure the theme carried out at the party. There were two elements to this: the entertainment and the food. There were a range of games we all played in our childhood that I could of picked for my party, such as pass the parcel, but I decided to only pick two games. I thought picking two would allow room for the natural flow of the party and keep it fun so I selected pin the tail on the donkey (I figured this was a fun game - funnier yet after a few drinks! And added some cute decor to the party) and a pinata (because most people's sweet tooth didn't die after childhood). I purchased the pin the tail on the donkey from the Big W party store and made the pinata using a balloon and classic paper mache using newspaper and coloured crepe paper (google it). I was worried that the games may be a miss with an adult crowd but they ended up being hit, probably because it had been so long since we had all played them. I also bought some cheap photobooth props off Ebay so people could play around with them and take selfies. Lollies, party pies, mini sausage rolls, chips. These were all staples at parties when I was a kid so they were all featured on the food table at my party. I also whipped up two other Aussie kid party classics: chocolate crackles and fairy bread! I loved chocolate crackles, and would whip up a batch most school holidays so it was a must at my Childhood party. They are also super easy to make. Melt 250 grams of Copha in a saucepan over low heat, mix in 4 cups of Cocoa Puffs, 1 cup Icing Sugar, 3 tablespoons of Icing Sugar and 1 cup of desiccated Coconut. Spoon the mixture evenly into patty cups. Because I was also trying to establish a rainbow theme, I sprinkled some 100s and 1000s on top before allowing them to set in the fridge. Not only was this a kid's party must have dish, the rainbow sprinkles went with the rainbow theme I was also trying to establish. Fairy bread (if you live under a rock) is super easy to make: get your bread, spread butter and then cover in 100s and 1000s (sprinkles). To make it a bit more cuter, I first used a cookie cutter to cut the bread into little bit size circles. Haha what an awesome way to celebrate your 25th!!! Happy belated birthday by the way!! Sounds like you had an amazing time! Happy birthday if it still counts :D Seems like you had a perfect day! What a great party idea Dani. Chocolate crackles and fairy bread bring back so many memories...you know I don't think I've ever made our kidlets a batch of chocolate crackles before, I think I need to change that! Such a great theme, I love your costume too. Although you are making me feel old as I turn 35 tomorrow, I do have quite similar party memories in terms of food and party games!